You could feel the room shift as soon as the lights went dim. It was the middle of fall quarter, and in a basement classroom of the Logan Center for the Arts, Sidney Nagel was starting off his students’ morning in a shroud of not-quite-total darkness. All fall, in teams of three or four, they’d been working on projects—an installation, an image, a device—meant to explore the particular qualities of low light. This was the class’s only assignment, and Nagel worried that the students might be getting caught up more in the idea of light itself: their works in progress so far showed more sunshine than moonlight. “Everyone seems a little bit unsure of what you’re supposed to be experiencing,” Nagel said, heading for the light switch. “If I say low light, what’s the first thing that comes to mind?” The room went dark. Both men have also centered their professional lives around the close observation of everyday events, mining new meaning from experiences the rest of us take for granted. “Many complex phenomena are so familiar that we hardly realize that they defy our normal intuition,” reads the homepage of Nagel’s laboratory website. An experimental condensed-matter physicist, he studies the “cascade of structure” contained in the drizzles from a spoonful of honey, the molecular disarray concealed in a pane of glass, how droplets form and fall and splash, and why sand sometimes flows like liquid. Carpenter’s projects often prompt that kind of realization, the sudden awareness of something visible but unseen. In college he studied architecture and sculpture, emerging with a degree in the latter, but his true fixation was the study of light and how it defines the experience of place. With his firm, James Carpenter Design Associates, he constructed a window for a seminary chapel in Indianapolis that casts silhouettes from the landscape outside—clouds, trees, birds in flight—onto an interior wall; bars of light, shifting as the sun moves from one horizon to the other, shimmer across the chapel’s cross. For a private home in Minneapolis, Carpenter transformed a window looking out on a neighbor’s fence into a “periscope” that collects its view instead from the sky and the canopy of a nearby tree. 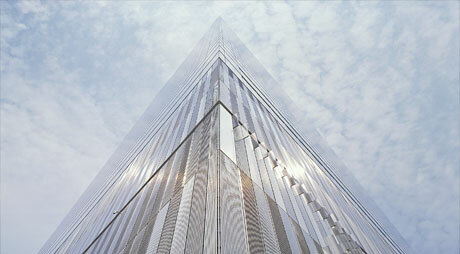 Designing the outer envelope for Seven World Trade Center, the first building to go up at Ground Zero, Carpenter embedded stainless steel prisms in the surface to attract light that wouldn’t otherwise reach the densely surrounded building, drawing it out of the shadows. Carpenter also designed the three Midway crossings to light pedestrians’ paths between the north and south ends of campus. 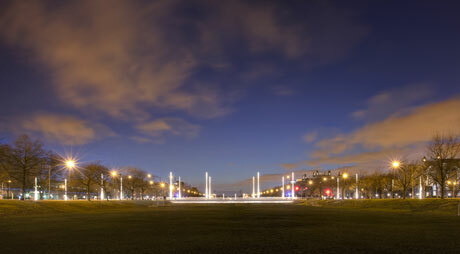 As the sun sets, tall masts of LED illumination gleam upward from widened sidewalks. The “light bridges,” as they’re commonly called, evoke Edward Law Olmsted’s 1871 plans, never realized, that envisioned the Midway as a Venetian canal connecting the lagoons of Jackson and Washington Parks. At night, the bridges seem almost to be floating above a dark sea. The first place it took them was to Greenland. In December 2011, around the time of the winter solstice, the darkest period of the year, Nagel and Carpenter spent four days in Nuuk, Greenland’s capital city. Carpenter was there to research a future project; an admirer of winter’s gray, Nagel came along for the exploration. “To look at light when there wasn’t much of it,” Nagel says. There was never much of it—and what there was was mostly gray. Daybreak came at around 10:30 a.m. each day, and within four hours the sky was dark again. They tromped through snowdrifts and watched the sun tilt along its tiny arc at the base of the horizon. At night they could see slabs of ice slipping out to sea in the darkness beyond the fjords. Nagel noticed that the light seemed more polarized than in Chicago. Carpenter noticed that the sky seemed brighter up toward the North Pole. “Which you would assume would be darkness,” he says. “Yes, it wasn’t subtle,” chimes Carpenter. By the time Nagel and Carpenter arrived home, the idea for the class was starting to take shape: a course exploring the physics and aesthetics of low light, especially natural light. They’d ask students to make close observations, to pay attention to their senses and perceptions. And they’d teach it in the receding light of fall. “None of you should be inside your comfort zone right now,” Nagel said, calling the class to order on the first day. “The scientists should be trying to think in terms of the art, and the artists should be trying to think in terms of the science. This is not easy.” About 20 people signed up for the course—MFA students, physics PhD students, undergrads studying science, math, art, English, psychology, public policy—none of them quite knowing what to expect. Week after week, while Carpenter and Nagel offered lessons on refraction, interference, polarization, and the behavior of what Carpenter calls “volumetric light,” interdisciplinary teams of students toiled away on their final projects. 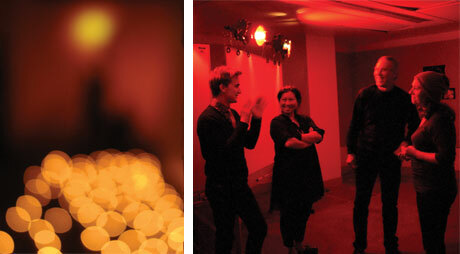 They experimented with candlelight, underwater illumination, LEDs, infrared light, sodium lights, and smoke. Nagel and Carpenter kept urging them to dig deeper, to loosen their imaginations and hone their observations, to move beyond science projects and artistic concepts. Others, though, had struggled. Science students found themselves sometimes mere engineers of their arts classmates’ brainstorms; artists found themselves intimidated by the enormous complexity of the science. “We catch ourselves talking past each other,” said one physics PhD student of his teammate, a scupltor. A film MFA student said he and his team had found difficulty in “moving beyond phenomena and taking that next step” into art. “That whole process of thinking and rethinking is interesting. And kind of a struggle.” There was real frustration in their voices, and real effort. You could sense them reaching beyond themselves, leaving the comfort of their expertise. “There’s no clear path,” someone said. Perhaps not, but there is always the journey ahead, the exploration. “Some of you talk about science as this certain process,” Carpenter, who’d been listening to the discussion, finally said. “I think it’s closer to art, where you’re trying to arrive at an understanding, the exploration of a concept.” In both, “there are many, many false starts, and then eventually ... you cast away your immediate ideas and arrive at something that’s more coherent—a solution, a resolution.” The light.